Loveland, Colorado is a special place all year around, a community of creativity and art, with scenic views and majestic mountains. But the town really shines once a year, on Valentine’s Day. Lucky Roberts has lived in Loveland his whole life. He has good friends, strong family support, and is all about keeping his community fun and alive. The only thing Lucky has been “unlucky” with is love. But rather than avoiding February fourteenth in his hometown, he throws himself into helping others deliver their messages of love. Enter Jack Canon. Jack moved to Loveland for a fresh start, in both his personal and professional lives. After a tough year, he’s finally hoping to just blend in, maybe carve a little niche for himself that his parents would have been proud of. What he didn’t expect was a pseudo-lumberjack with a killer body and shy smile to turn his world upside down – and he sure didn’t expect to like it so much. When Lucky meets Jack, he feels like a thirteen year-old with his first crush. He’s clumsy, stammering, and the first greeting out of his mouth is a less than articulate, “Wow!” Words like adorable and manbun suddenly become part of his vocabulary as he discovers a deep, hidden need to romance the hell out of Jack. And what better way to do that than during the most romantic season in the City of Love? As I already said in my reaview of Textual Attraction (https://scatteredthoughtsandroguewords.com/2016/01/04/a-stella-review-textual-attraction-by-k-lee-klein/), I’m a huge fan of K-lee Klein. Her writing style is great and always exactly what I like to read. Lucky in Loveland is her first self published story and the beginning of a new series called Welcome to Loveland and in my opinion she did well. I think the perfect adjective to describe it is adorable. It’s exactly the feeling I got through all the reading. The story starts with Lucky volunteering in the local kindergarten school where the handful little Daniel goes and most of all where the new-in-town Jack has begun teaching. He just moved to Loveland after the death of his parents. The characters are cute and sweet together in their dates, the teasings, the stuttering, the blushing. Sweet but not childish. And the setting was unexpected, Loveland, the little town where the Valentine’s day is high celebrated. The atmosphere was magical and it carried me there with the MCs. I honestly am looking forward to the second book to come out. If you’re looking for a light story with no drama and angst, quick and humorous, Lucky in Loveland is your book. Give it a try! The cover designed by Karrie Jax is a winner. I particular like the colors and the style. Well done. 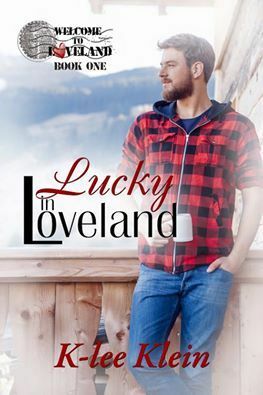 This entry was posted in Book Reviews, Books, Contemporary fiction, eBooks, LGBTQ Book Reviews, M/M Book Reviews, M/M Contemporary Fiction, M/M Fiction, M/M Romance, Uncategorized and tagged A Stella Review, A Stella Review :Lucky In Loveland (Welcome to Loveland #1) by K-lee Klein, author K-lee Klein, first in a series, gay fiction, gay romance, Lucky In Loveland (Welcome to Loveland #1) by K-lee Klein.